The 23rd part in the GINZA×CSR series introduces the social contribution activities of Ginza Sayegusa, a long-established store with a 147-year history that opened in the Ginza district in 1869, the year after the Meiji Restoration. We interviewed Ryo Saegusa, the CEO of Ginza Sayegusa who actively and enthusiastically participates in CSR activities that utilize the unique strengths of a children’s clothing brand, with activities ranging from those using the shop space to a nature experience program for children in a rural area. – You have been carrying out the Sayegusa Green Project (http://www.sayegusa-green.com) as an environmental and social contribution activity since 2012. I was talking with an old friend one day, and we started talking about where all of our CSR efforts should belong. I was convinced that the meaning of CSR was for adults to take responsibility and try to resolve social issues for the children of the future, and the catalyst for our activities was my realization that we should focus on children. After that, I attended workshops and other programs and considered what shape CSR that is distinctive of Sayegusa would take. Through this, we arrived at the idea that we should be able to teach children about the importance of the environment as a children’s apparel store, and at the “Earth for Children” concept. In the Thinking Green campaign that uses shop space, we put up eco-friendly lighting in the shops and created an interior décor filled with green (twice a year from August 2012 to February 2015), and we hold workshops about the environment for children. We also published an online picture book about a small owl prince who lives in the forest, with the hope of imparting the importance of the environment and nature to both children and parents. In 2013, we started the ‘1% for Green’ project to put 1% of our profits towards environmental preservation activities. – In 2014, you started the Sayegusa Green Magic nature experience camp program for children. As one of the activities using the 1% for Green project that I just mentioned, I thought we could create an experience-based program that gives children who have few chances to be in nature an opportunity to experience true nature. With Sakae village in Nagano prefecture as the field, we worked together with an outdoors specialist NPO that is active in the local area to develop a camp program called Sayegusa Green Magic that lets children experience a rich natural environment and learn about Satoyama (rural mountain woodland community) living from older men and women. Since 2014, we have held it twice a year in summer and winter, for a total of four sessions so far. Thanks to everyone’s support, many children come back again, and a growing number are participating in every session. This year’s winter session filled up in no time. In the future, we would like to hold sessions more frequently and find a field where even more children can participate. – Why did you make the program for children only, rather than parents and children? We are confident that we can use our past experiences to provide a safe and worry-free environment. By deliberately providing an interactive place for only children, I wanted to offer a special opportunity for both children and their parents. There were even some parents who were amazed because their child who could not eat vegetables before began eating them as soon as starting their time living in a kid-only community in the field. In addition to experiencing nature directly, developing the ability to create new forms of play in the forest and participate in group action during the younger years leads to the development of independence, creativity, and cooperativeness, which are great bonuses for a child’s growth. – Why did you choose Sakae village in Nagano prefecture as the field? Sakae village was destroyed in the earthquake in North Nagano prefecture that occurred on March 12, the day after the Great East Japan Earthquake in 2011. The Kotaki district that is one small settlement in Sakae village was closed to the outside until then, and there was one person who was working to open it up to revive the area. My meeting that person was the main catalyst. Sakae village, and Kotaki in particular, retains the original landscape of Japan and is a place where you can experience true Satoyama living. I sensed similarity with the passion of Sayegusa that emphasizes “the real thing.” Many of the people who visited this place through Sayegusa became fans of Kotaki and developed a bond with the local area. Starting this year, we will also being holding hands-on programs for parents and children to try rice planting and harvesting. In doing this, my plan is to enable parents and their children to experience the joy and sense of fulfillment of working together in the natural environment. – You are also participating in the rebranding and sale of rice from Sakae village and the Kotaki region. In order to contribute to reconstruction of this area that has a target of the Satoyama still remaining after 300 years, I thought that perhaps we could support its activities for production of rice that is the most highly valued in this area, utilizing our marketing expertise. In 2014, we helped rebrand a rare variety of Koshihikari rice called Kotaki rice as a brand of world-class rice from Japan. We sold it as year-end gifts packed into wine bottles, and they were such a hit that we sold 1,000 bottles in a week. In 2015, we launched the Kotaki Rice & Future brand (http://kotakirice.jp), and we have since begun full scale marketing activities. – What has the response of your employees to CSR activities been like? What surprised me the most was that job applicants almost always ask about the Green Project in their employment interview, and this pleases me greatly. While understanding about our initiatives has permeated well throughout our company compared to the beginning, I feel that I want each person to start CSR activities within their own hearts. What I am currently considering is building a system at the shops for reusing children’s clothing. As clothing from Sayegusa lasts a long time, many customers hand down clothing to family members or relatives. However, there are fewer and fewer chances to do this as the birth rate continues to decline. For example, if we could create a system in which the shops accepted children’s clothing that is no longer needed so that it can be reused many times before being returned to the earth, we would not only reduce the environmental load, but also create a chance for our staff to deal with CSR on a daily basis in their regular job. – Ginza has garnered attention as a district that continuously leads the era in cutting-edge ideas while continuing to value tradition. What vision do you have for Ginza going into the future? Ginza is a district of Japan’s leading culture. I want Ginza to continue to be the pride of our country. Competing solely for greater glamor or luxury will result in an awkward district 10 or 20 years down the line that is behind the times. We must start incorporating environmental and social perspectives into district development. Ginza is called a district that takes things by storm and has continued changing from the start. If the thousands of shops in Ginza joined forces to act, we could create great power. For example, if all the shops simply switched to LED lighting, it would have an enormous impact. Or, for example, if all the street lights were powered by renewable energy sources such as solar power, it would have a strong influence on other districts. I want to envision a new Ginza through these types of activities. CEO of Ginza Sayegusa Inc. 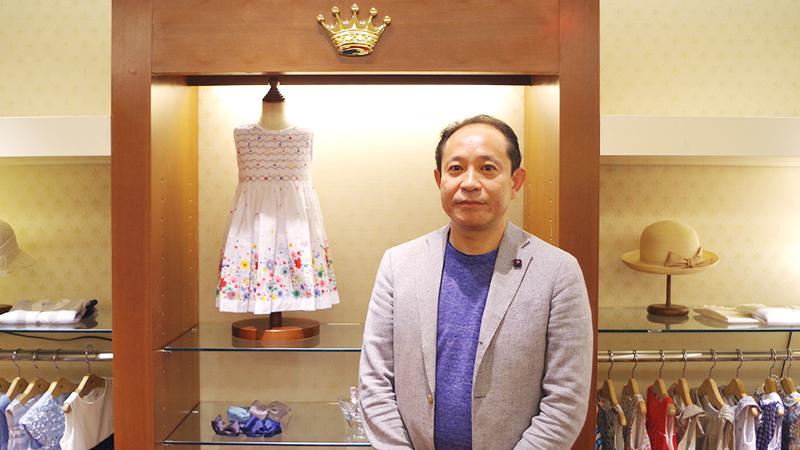 The CEO of Ginza Sayegusa, a well-known children’s apparel store that opened in 1869. Helped launch this website as one young, future Ginza-leading proprietor as a side job in his days as senior executive director of the company.